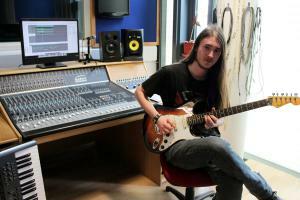 Sound & Music Production student Jack Cape has been commissioned by publishers Curious Fox to produce a piece of music inspired by a new novel; Half my Facebook Friends are Ferrets by local author Jackie Buckle from Reigate. The book is about a fifteen-year-old boy who fantasises about becoming a death metal guitarist and is full of humour, technology, music, friendship and a ferret called Ozzy. Jack penned a heavy-metal-style track called Like a Mockingbird, taking its lyrics from the book. The promotional song will be used as part of the national marketing campaign for the book.